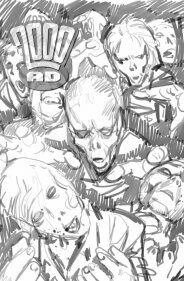 Tharg's brief was to have a shot where lotsa zombies were rushing towards us, based on a sketch by Dom Reardon of the horrible uglies in an underground tunnel. Being a fan of George Romero's zombie flicks this was easy to visualise. It's also how I see xmas shopping. It's been a while since I drew monsters, so I was very concerned if I still had the evil touch. 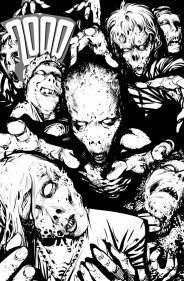 Several glasses of blackest drinking ink later I set to work and hey presto, the decomposing hordes of the undead came to un-life before my very spectacles. The plan here was to create a sense of lighting as if the viewer had just flicked on a torch in the darkness and seen these buggers oozing towards them. This was the almost final version. I did this in monochrome to set up the tones, but I kinda liked it. The sickly green gave my putrifying children a nice feeling, and I would have gone with it if all my peers hadn't suggested otherwise. 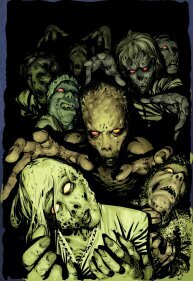 To remedy the situation I merely altered the hues of each zombie a little. Warm yellowish puke colour at the front, cold titanic-at-the-bottom-of-the-atlantic green-blue at the back. I also gave the guys some funky eyes. 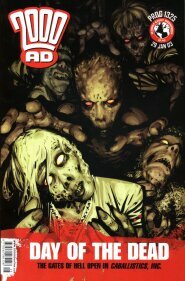 I wanted it to seem like at the front they had regular bloodshot eyes, but as they went further into shadow it was something more demonic.